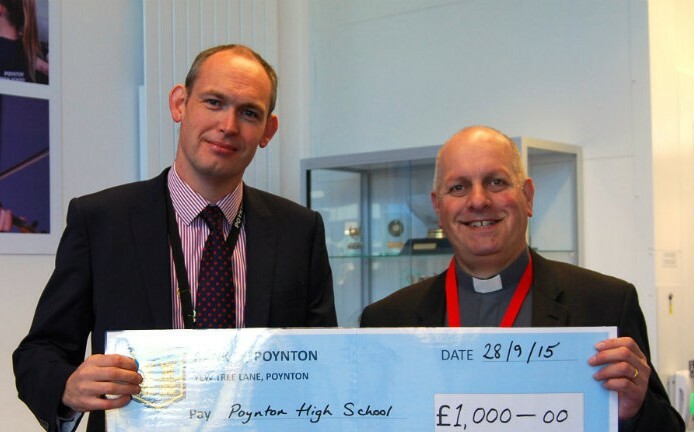 Rob McLaren, Vicar of St Georges Church on Chester Road in Poynton, recently visited Poynton High School to present them with a cheque for £1000 towards their new Minibus Appeal. The money was raised through the Lady Warren Bulkeley Charity- a local Poynton charity which awards one-off funding for those in Poynton in genuine need. Much of the money was raised by the Captains of Davenport Golf Club and was presented to the school at a special assembly. Pictured is David Waugh with Rob McLaren. Next articleVernon Staff Show Their Support!